I like to let my Ancho Magnifico peppers ripen from green to red before harvesting them. The richer flavor that develops with the color adds another sweet/spicy layer to the gentle hot of these huge poblano peppers. But as the pepper season winds down the last remaining Ancho Magnificos are still green with little prospect of turning red. I harvested all of them, a dozen or so, yesterday afternoon during a break in the rain and roasted, skinned and seeded them. Even after roasting, they taste a little raw to me compared to the red versions but they are still very flavorful and they make a wonderful soup. I froze most of them but kept out enough to make Anna Thomas’s Sopa de Poblano from her inspiring cookbook Love Soup (2009). She introduces this recipe as “one of the most delicious soups I’ve eaten…a velvety puree, creamy from goat cheese, slightly spicy but not too hot, and full of the true flavor of fresh poblano chile peppers.” It is as delicious as she says and I have been making it in the fall with the last of the poblanos and then throughout the winter with frozen roasted poblanos both green and red. Don’t worry if you don’t have epazote or cilantro. The soup will still be delicious. I also stir the goat cheese in at the table and often substitute pecans or hazelnuts for the pine nuts. Whatever the variations, this is a great soup to stand up to the start of the rainy season. Roast the chiles under a broiler, in a dry skillet over high heat, or on a charcoal grill, turning them from time to time until the skin is charred and blistered all over. Place them in a paper bag for about 10 minutes to let them sweat and then peel off the skins and remove the stems and seeds. Cut the peeled chiles into strips; you should have about 1 and 1/2 cups of peeled poblano strips. In a medium nonstick skillet, heat the butter and olive oil and sauté the onions, stirring often, until they are translucent. Add the minced garlic and some salt and cook over low heat, stirring often, until the onions are golden, 20 to 25 minutes. When the onions and garlic are very soft, combine them in a soup pot with the chile strips, broth, cilantro, and epazote. Cover the pot and simmer everything for about 20 minutes, then puree in a blender, in batches, or with an immersion blender until the soup is perfectly smooth. Add the goat cheese to the pureed soup, stirring over low heat until the cheese has melted into the soup. Taste, and correct the seasoning with a pinch more salt if needed. 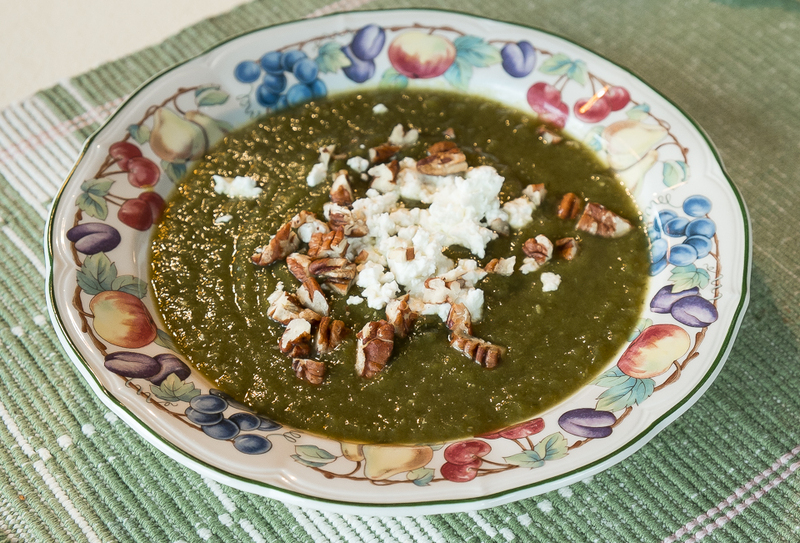 Serve the soup hot, with lightly toasted pine nuts scattered over each bowl. Because of its deep, intense flavor and spicy edge, this soup is best served in smaller portions as a first course — although people may ask for more. 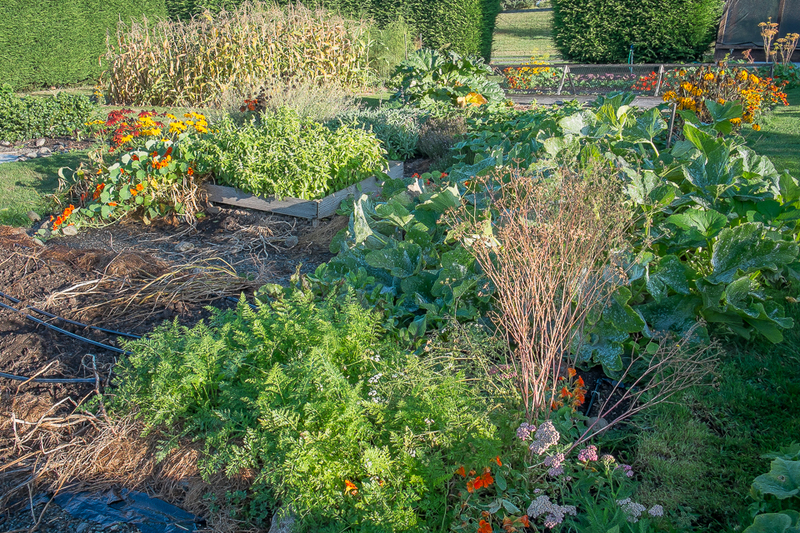 What is it about the autumn kitchen garden that is so appealing? Leaves are turning yellow and brown, drying and dying, rustling and falling from stalks and vines, mildewing, shriveling and collapsing. Yet in the golden light of autumn mornings or late afternoons these dying plants are so beautiful, every bit as beautiful as the vigorous fall and winter crops growing robustly in beds around them. 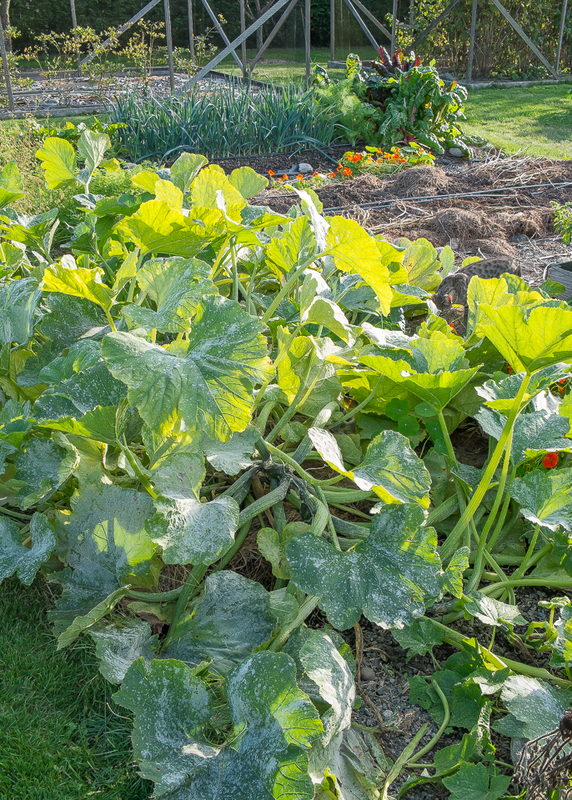 One appeal of these changing leaves may be that they signal the ripeness of vegetables that have been maturing slowly all summer. Corn, dry beans, potatoes, onions, winter squash have finished growing; some already begin to fill the winter larder, others are ready now to dig, pull or shell. But while there is a satisfying sense of harvest, I think the pleasure in these spent plants comes less from the vegetables they’ve produced and more from their dying leaves. 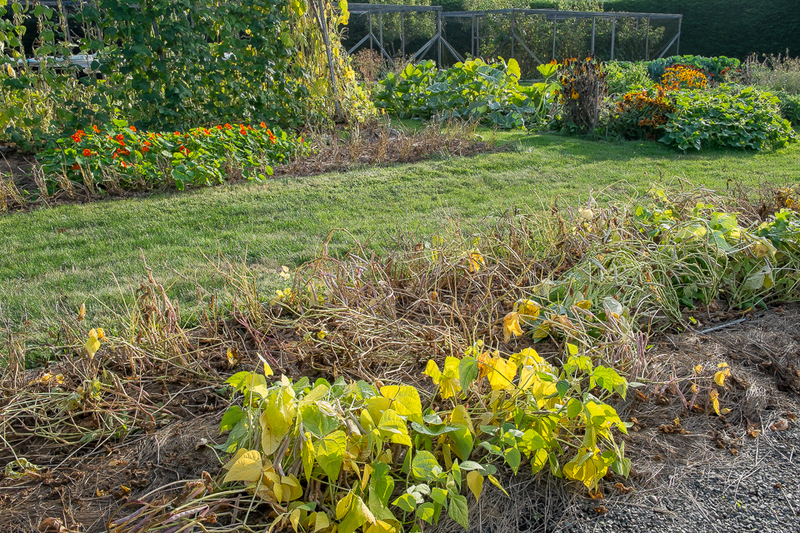 They mark the end of the season’s cycle in the kitchen garden in the same way that the yellows and browns, russets and reds in the larger landscape mark the end of summer, the coming of fall and winter and the restfulness of these seasons compared to the rush of spring and summer. Or perhaps the appeal of the kitchen garden this time of year comes from the mix of dying summer foliage and vigorous fall and winter green. 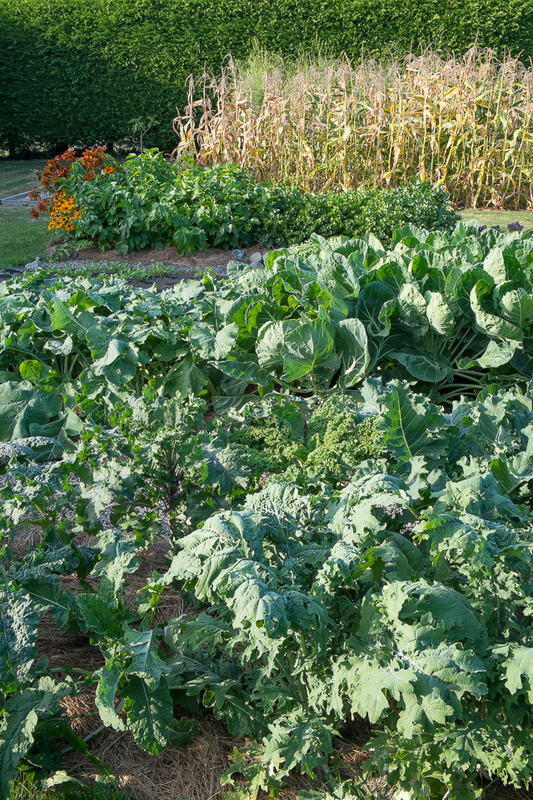 In among the fading summer plants there are beds filled with robust winter crops: kale, Brussels sprouts, rutabaga, turnip, celery root, parsnips, leeks and hardy salad greens. Planted in June and July, they too are part of the restfulness ahead. Settling into the cooler season, they will hold in the garden, sweetening after some frosts, ready for harvest when we want them and like the storage vegetables part of the winter larder. Though I look forward to each spring’s new planting and growth and to summer’s abundance, fall is my favorite season, the softer colors and slanting light, the slowing down, the rest ahead and time to reflect on the year past. One of the pleasures of living in a climate where we can grow vegetables year-round is that my food preparations for the winter season happen outdoors in the garden rather than inside in the kitchen. Mid-July finds me transplanting leeks, planting kale, rutabaga, carrots, beets and turnips, and from August to late September I’m planting radicchio and escarole, arugula, mustard and mache or harvesting storage onions, potatoes and winter squash. For me, there’s none of that canning and freezing of peas and beans, broccoli and cauliflower, carrots or beets that kept my mother in her New England kitchen on so many lovely summer days. But there does come a time in late August and early September when the abundance of a few favorite summer crops sends me to the kitchen, to the blanching kettle and the freezer bags. Shell beans, corn and peppers are delicious right now fresh from the garden, but they are also easy to process and freeze and, even more important, they are versatile additions to the winter kitchen and even after some freezer time taste almost as good as fresh. So for about a week at the end of summer I become my mother, checking the ice and freezer bag supply, watching the crops for perfect ripeness and finally setting aside some time indoors to take vegetables from harvest to freezer. Shell beans are ready to harvest when the pods are still flexible and the beans inside are fully formed but not yet dry. 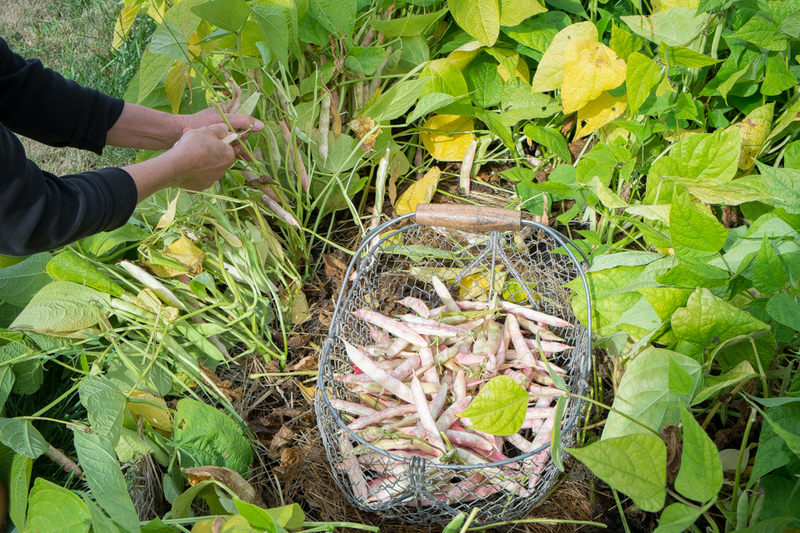 Shelling the beans from the pods is the time-consuming bit but it is a task I can do while sitting outside, taking in the view and the colorful beans that tumble from each pod. 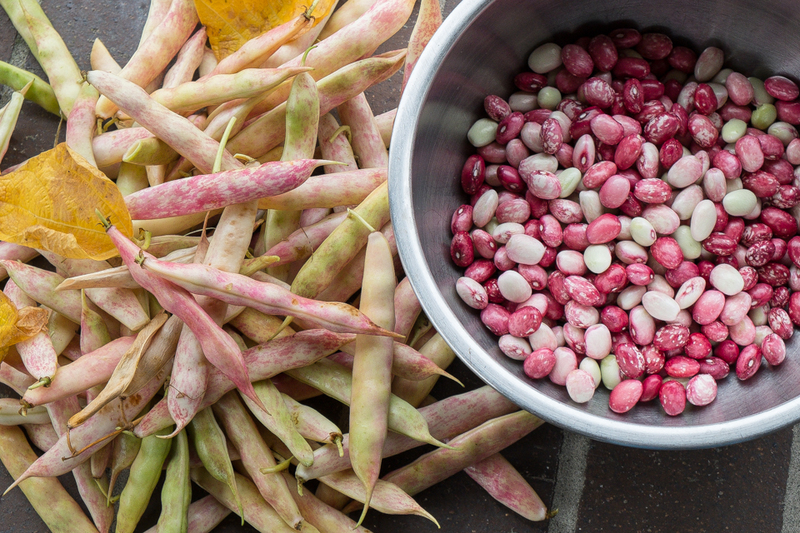 Blanching, chilling and freezing these shelled beans is much faster: blanch for three minutes in boiling water, chill in lots of ice-filled water for another three minutes, spread on a towel to dry a bit, pack into freezer bags and put in the freezer. The shell beans I grow are a cranberry bean variety from seeds I got from Territorial Seeds in the 1980s and have saved each year. Corn is ready to harvest when I pull back a bit of husk on a few ears and see firm yellow kernels filling the cob. It’s a check-every-day sort of thing. 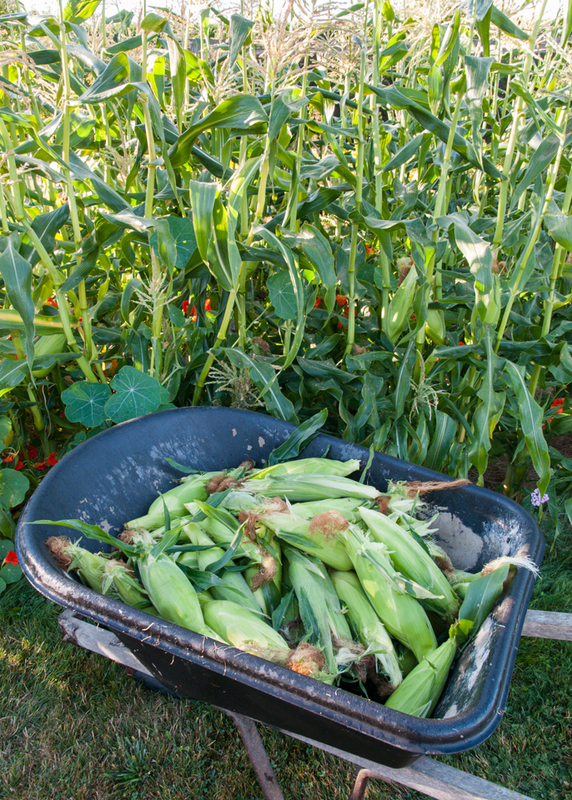 Unlike beans, whose harvest window is about a week wide, corn needs to be picked as soon as it’s ripe or the sweet crispness will shift to starchy chewiness. 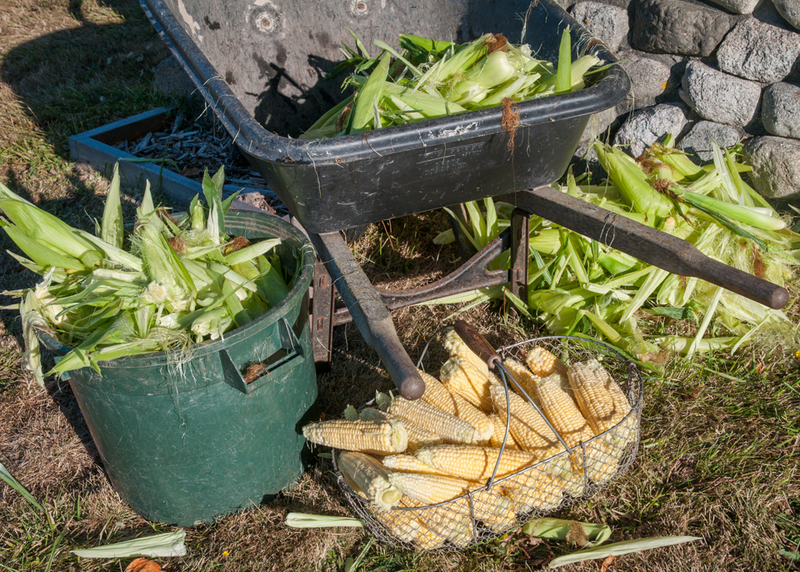 Compared to the quiet neatness of bean shelling, husking ears of corn is a noisy, messy task, ripping and tearing and lots flying corn silk. And the smooth, yellow ears take longer to process than beans do but the prospect of corn in winter makes the mess and time worth it. 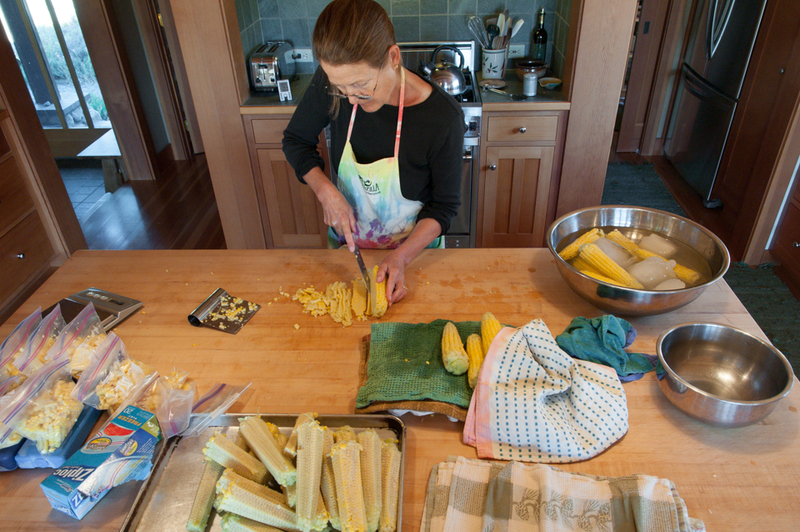 Boil the cobs for 6-8 minutes (my kettle holds six ears at a time), chill in icy water for another 6-8 minutes, drip dry on kitchen towels, slice the kernels from the cobs, pack into freezer bags, chill a bit more and put in the freezer. The corn I grow is Seneca Horizon from West Coast Seeds. 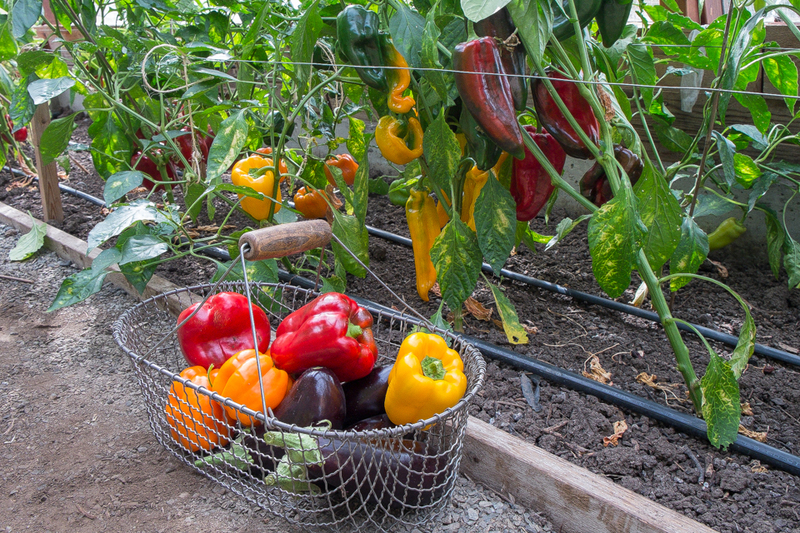 Peppers have the longest harvest window as they slowly turn from green to red, orange or yellow depending on the variety. 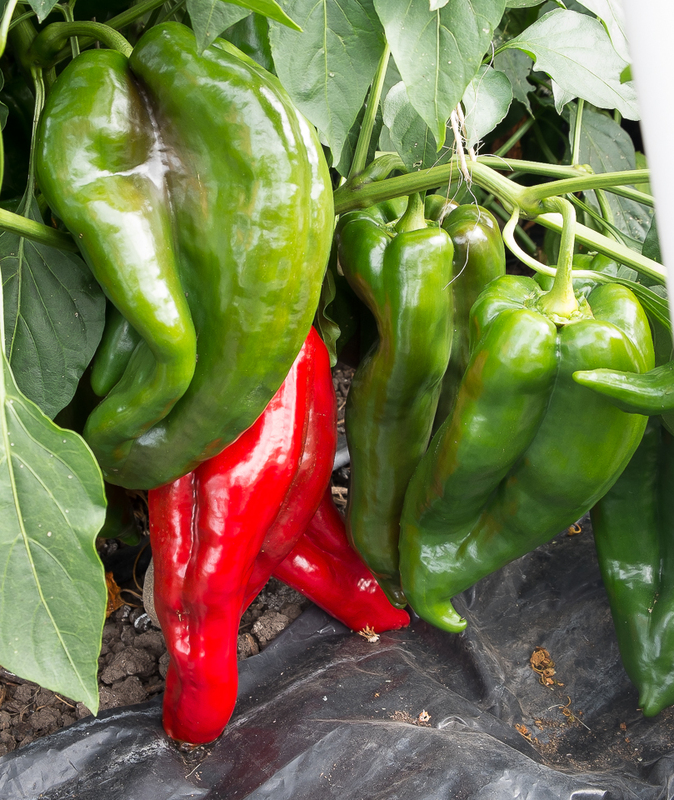 I like the sweet flavor of fully ripe peppers so I harvest the most colorful and leave the green or partially green peppers until the next round. 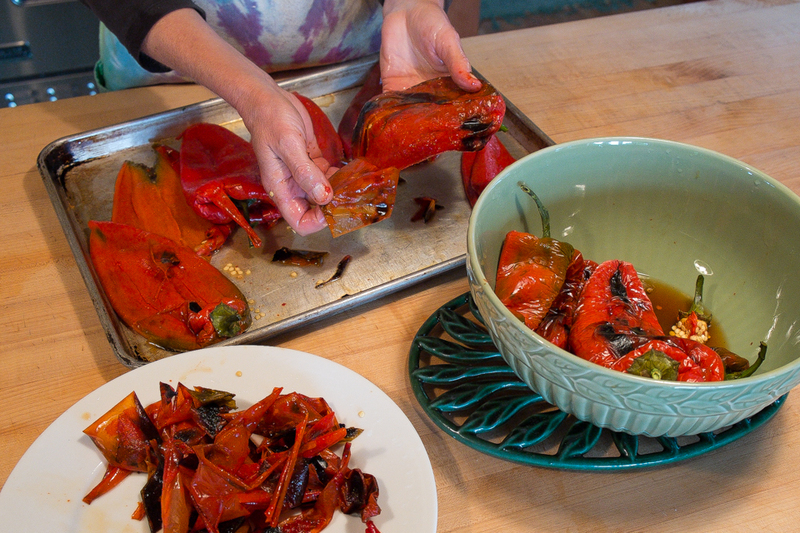 To prepare them for freezing, I arrange whole peppers in a single layer on a large sheet pan and slide them under the broiler, turning them as each side blisters and blackens until the skin on all sides is loose. Next I pile them in a large bowl, top the bowl with dinner plates and leave then to steam for about an hour until they are cool enough to handle. Then it’s pretty easy though a bit messy to peel off the skin, spread open the flesh and remove the seeds. Once they’ve cooled, I slide them into freezer bags, seal and freeze. For sweet red peppers, I grow Revolution and Carmen, for a sweet orange pepper Gourmet, for a sweet yellow pepper Flavorburst and for Poblano chilies Ancho Magnifico. With the work of harvest and preparation done, these packets of frozen shell beans, corn and peppers make quick winter meals. I get it why my mother put all those summer hours into filling the freezer. For a quick bowl of beans, I boil the frozen shell beans until they’re soft, ten minutes or so, dress them with olive oil, salt and pepper and serve. I also add them to sautéed kale or escarole, to pasta, risotto and farro and to soups. With frozen corn, I prefer to thaw the kernels first and sauté them quickly in olive oil or butter, but you can also boil the frozen kernels just until they’re hot, drain and serve. Shell beans and corn mixed together and served with butter, salt and pepper make that perfect New England dish: succotash. I loved it when my mother served it and love it still. At room temperature mixed with slivered dried tomatoes and some pickled red storage onions, corn and shell beans make a delicious winter salad, not quite as crisp as the summer version but still wonderful. And frozen peppers are good in all sorts of things. I thaw them and use them to top pizzas, brighten pasta sauces, stews or frittatas or blend into spicy Romesco sauce for meats or vegetables. Having shell beans, corn and peppers in the winter larder is worth spending a few precious summer days indoors. My mother would be pleased.